Bent a crankset spider a while back, when I tried to remove a bottom bracket cup from the NDS with the crankset still bolted on. Threaded chains through frames wrong many times. Put headset bearing cages in upside-down and crushed them over and over again. Lol ... now that is funny! I have a recent one. I treated myself to some DA wheels, and of course, put the cassette on myself. I went for a ride and man ... the shifting was terrible ... all over the place. Got back and noticed that I had left out one of the plastic spacers. 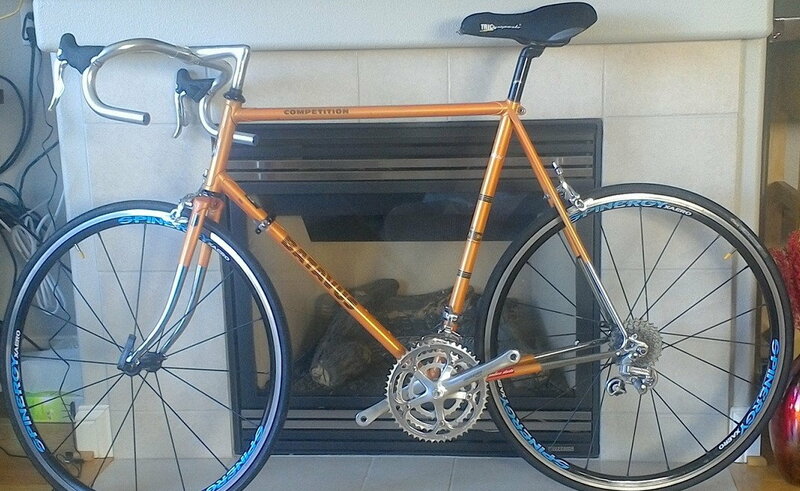 I had a Shwinn Traveler for a couple of years and since I couldn't afford a Cannondale and the factory was nearby I bought a newly painted frame for less than half the price of a complete bike. I figured I'd just move all my components over to the new frame. I try not to devote too much effort to ranking my mistakes. It's bad for my mental health. I'm thinking my dumbest mistake has to have been cutting a fork steer tube too short. I don't remember what I overlooked when I set up the trial fit, but I remember being unhappy with myself over the dumb error. the tank pumped out. Would have been double if I had cranked it up. Bike: stripping and rattle can painting my PX10. gathered around the cyclist working on the chain on the ground. We were next to a high school. FD did have a better tool set enabling repair of rivet. Where's a paramedic unit when you REALLY need one? Most recent screw-up was tightening down the lockring on a Shimano cassette, with the small cog not sitting in the right spot of the freehub. Crooked cog broke a piece off the threaded part of my freehub, trashing it. Although not exactly a repair, when I got my first road bike, a Felt, I made a point of keeping it clean. About once a week I sprayed the chain, rings and cassette with Finish Line degreaser. Too much all over the cassette ended up destroying the rear bearings. Using a brush and staying careful now. In the 80's in college, my only transport was my father's bike from the 50's. Single speed, fixed wheel, no brakes, tubular tires. I changed the rear cog and rode to my baseball game. At the bottom of a long downhill, I started back-pedaling to slow down and spun the gear loose, throwing the chain at 30mph. I was able to pull my baseball glove from behind the saddle and grab the front tire with it. (Much better idea than sliding off the saddle to sit on the rear.) Never forgot the lock ring again. At least that you’re willing to admit to!!!! I put a new larger cassette and longer chain on my new road disc bike. It shifted fine but was a little noisy on the stand. When I rode it the drivetrain was really a lot noisier than normal but it shifted fine in all gears. I did notice the crank didn’t spin as easily going backwards. I did several rides with it and the longest was 80 miles. I’m thinking I just got a noisy chain. I finally put it back on the stand and immediately spot the issue. I had threaded the chain over (instead of under) the short metal bar between the plates on RD between the jockey and guide pulleys. Felt like an idiot!! At least I haven’t succumbed to duct tape......yet! Made that mistake just last week! 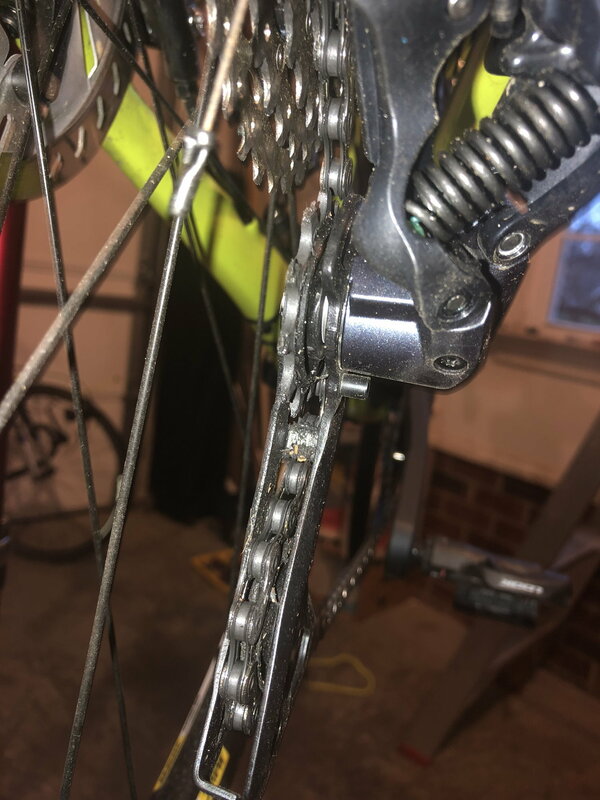 Similarly, I went for a ride after changing the chain and it was noisier than usual ... mis-diagnosed at first and was playing around with the front derailleur adjustment. Finally, set up my other bike side-by-side to the faulty bike and notices the chain was threaded over that little tab. Fortunately, I installed a KMC chain so, with the quick link, it was easier to fix. It is interesting how noise travels. I thought it was a FD issue as well. KMC chain with quick link here as well. I should have known as it just didn’t spin backwards as smoothly as normal. KMC is really taking over the world of bicycle chains these days, my entire fleet runs them. "All your chain belong to us." That's not too bad unless it's a tubular. One time, I glued on a tubular without taking note that it was a directional tire. Luckily, I came out the winner on the 50/50 chance. Oh, and about routing the chain through the derailleur incorrectly? There are two types of mechanics, those who will admit to having made this error, and liars. I drilled and tapped two 5 rmm nice holes for a water bottle holder on an aluminum Diamondback mountain bike. It's not earthshaking, but of the frame stresses out and cracks, it will be. I've set the bike aside til I can file out the threads and put in Riv-nuts which I understand will prevent any possibe damage. A dumb mistake was forgetting to pull thr 14mm bolt inside the crank handle when using the handy dandy crank puller., Everyone does that maybe once and says opps, but only we really dumbos go beyond that and stirp the threads. Even I wouldn't make that mistake: You put the front quick release lever on the drive side! .8mm threads, so it's all good. For other applications such as yours, I use Riv-nuts. Bike tracks better in reverse that way. Was removing a Shimano 600 non-drive-side crank arm from my Nishiki Tri-A so I could service the bottom bracket. Removed the crank bolt, threaded in the crank remover tool, put a wrench on it, gave it a good pull... and nothing, wow that old crank was really on tight. So I gave it a really, really good pull (because if a little force is good, then a lot of force must be better),... hey I think it's moving now... and stripped out all the threads in the crank arm. Turns out there was a washer still inside that was blocking the crank tool from pushing on the tip of the spindle. I did that yesterday. Tip of the crank tool wider than the 24mm square hole in my '70s Sugino 75 track cranks. I'm taking it to a man tomorrow. If I could remember all the dumb things I've done - no, if I could remember 1% of all the dumb things I've done with bike mechanics it would be LBS every time. And I've caught senior mechanics and industry legends at the LBS doing some pretty dumb stuff too. Should make us all quit. A bike doesn't have huge margins of error and every part of it is in some sense a safety system. Then you get on the bike and ride and get a good soaking in endorphins and forget your troubles and you are ready to do it all over again. Including the stupid mistakes. If it wasn't for our mistakes, how would we learn anything? I've done a few of these, but I'm amazed OP made it 80 miles. All I can say is if you don't want a black eye, push, don't pull. Guess this could be an "oversight" instead of a mistake. Anyway-the front der. on my road bike starting shifting poorly. Now, I've replaced nearly every part on my mtn.bike, and made all adjustments myself, and it's perfect. But that road bike der.had me baffled! It was the first time in 20+ years that I'd taken a bike to a shop. Turns out the front der. wasn't exactly parallel to the cogs! When the mechanic told me what I missed, I couldn't believe the one thing I had failed to check was the problem. And I knew this, but had neglected to check it! Rookie error, and I know better, guess I was in too much of a hurry. Last summer I replaced a tube on a nearby kids MTB. (I don't charge anything for repairs to local bikes brought to my retired "Gone fishing" bike shop by neighbors). I put 60psi in it and set into the back of my truck. About five minutes later from inside the shop I hear BLAM!! Flat again. I had forgotten the rim strip. I just can't figure why it took so long to blow.